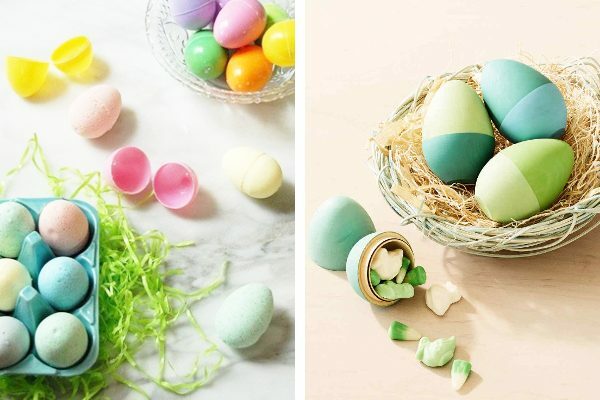 These DIY Easter egg ideas are candy free and include reusable options! Skip the plastic Easter eggs this year and switch to one or two of these ideas for a sustainable Easter tradition! When it comes to Easter we usually keep things simple. My mom always did a huge Easter basket for us when we were kids, but now that I live in a tiny house with my little family, I wanted to reduce our traditions down to the “bare necessities”. So we attend church, have a lovely home-cooked meal with the family (read that as a homemade honey baked ham), and then the cousins enjoy an Easter egg hunt in the yard. Since we like homemade and handmade items around here, I knew that I wanted that to carry over to our Easter eggs too! 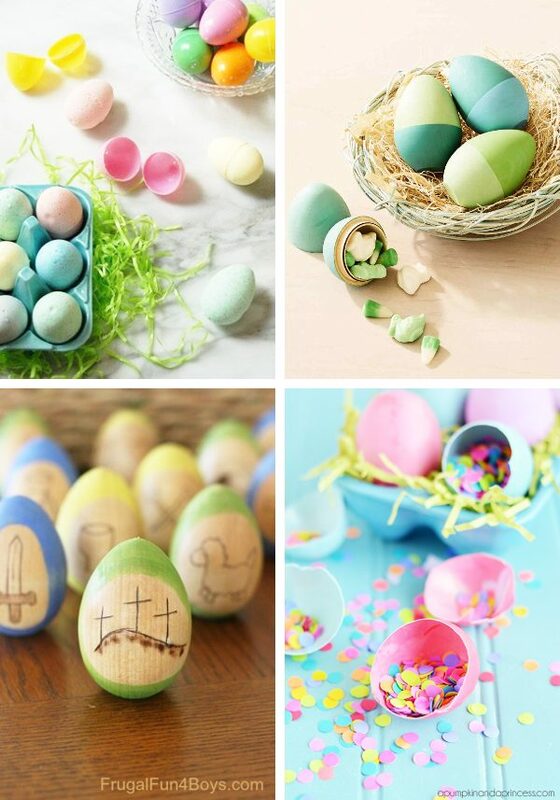 Here are our favorite non-plastic DIY Easter egg ideas that you can make yourself! Whether you’re the grandparent, the parent, or just the really cool aunt… these ideas will help you create some fun traditions for the kids in your family that help move away from plastic candy-filled eggs! When I was a kid my grandmother made a set of wooden eggs for the family to use at Easter, all lovingly hand-painted and downright gorgeous! This is not only a more sustainable option, but it’s also a great way to create a fun family tradition and set of heirlooms all at the same time! Grab a set of wooden eggs here and let your imagination run wild. You can paint a classic pattern, tie-dyed, or even just solid colors! 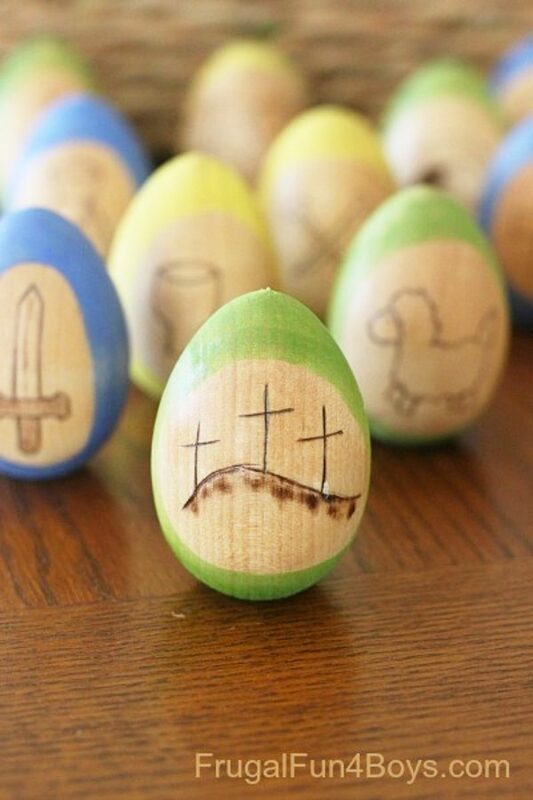 2: Wooden Easter Eggs that Open! If you still want to give a little treat inside each egg, you can also grab this really cool set of hollow wooden Easter eggs. Paint them the way you would the solid versions and have fun filling them! 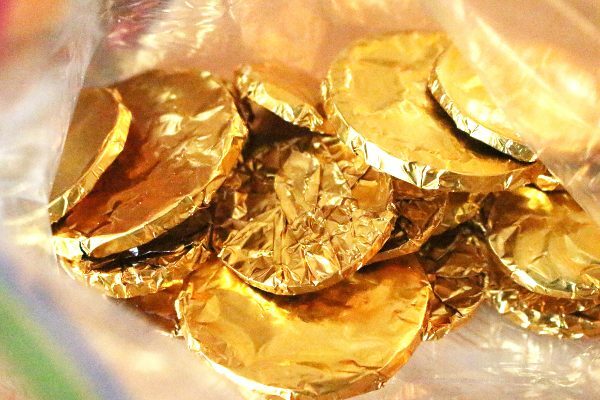 Here are some homemade candy options that we like to use to fill our eggs! 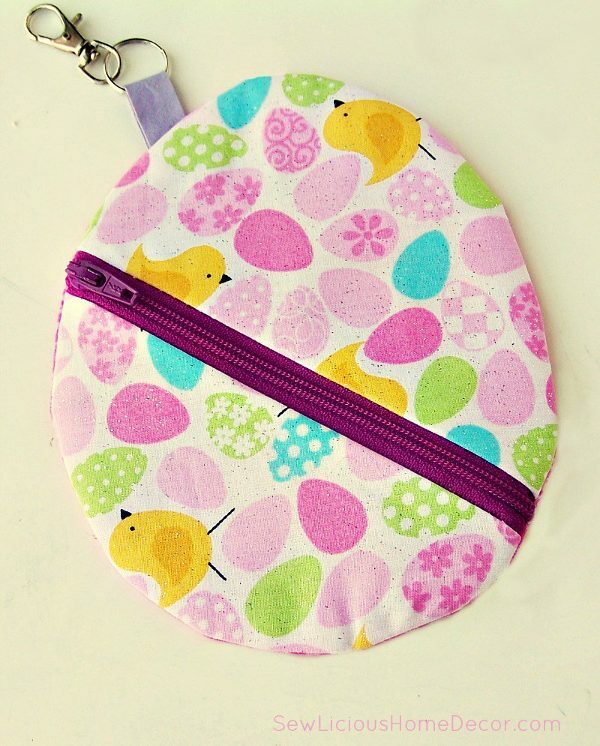 These can be made with the zipper in the bag to keep them fillable, or you can just stuff them and sew them shut! >> Follow this step by step tutorial to make your own fabric eggs! If you love knitting or crocheting, then these yarn Easter eggs may be right up your alley! Customize them in any color you want and keep them forever! 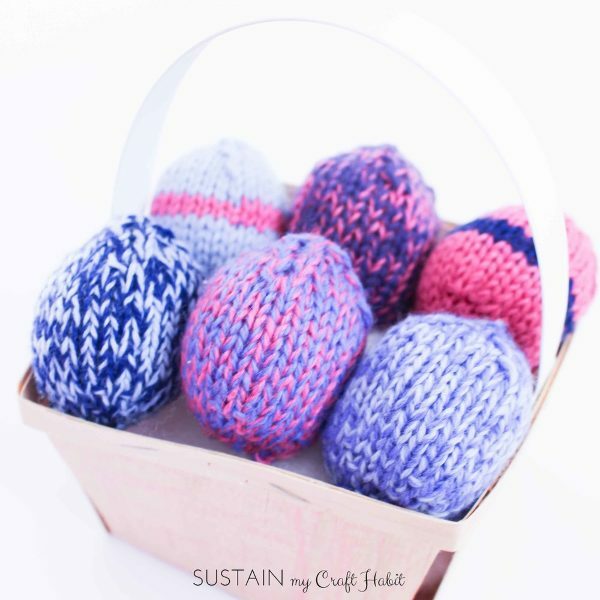 >> Get the pattern for these Yarn Easter Eggs here! 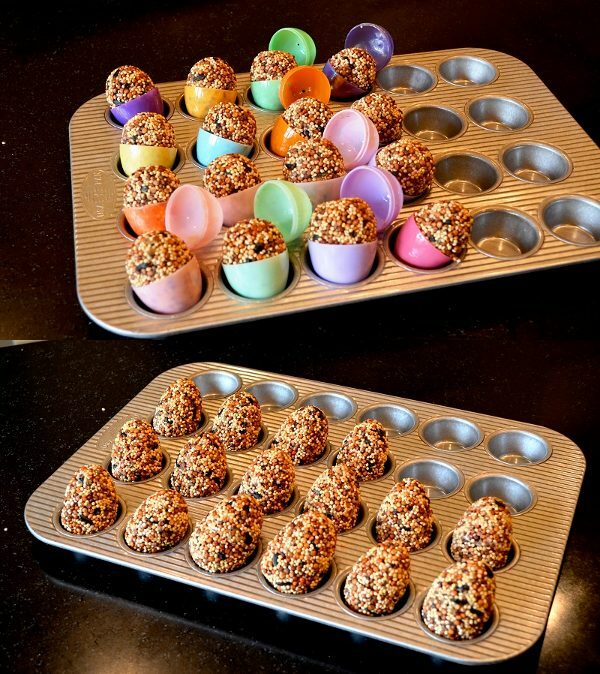 If you’re in a small space and aren’t excited about storing a set of eggs year after year, you can do a few different things to include Easter eggs in your holiday plans in such a way that they will be used (or eaten) within a few hours/days/weeks! I love the idea of combining an already loved Spring/Summer activity with Easter egg hunts. 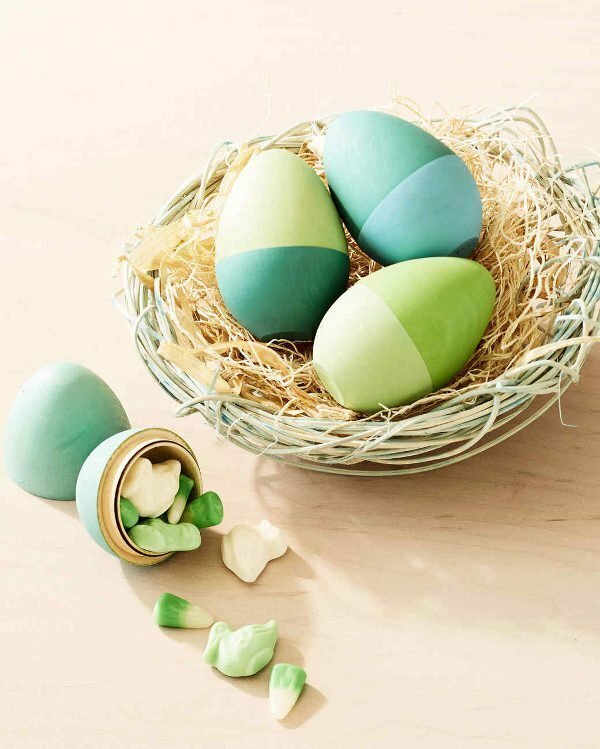 These chalk eggs won’t melt in the sun during the hunt, but will be used up before you know it! Saving space and acting as both the Easter egg and the goodies inside! 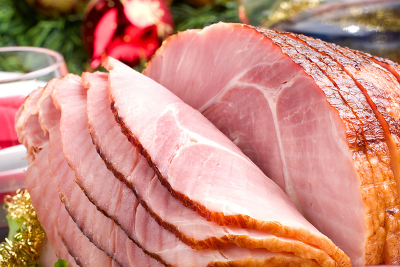 It also works to cut down on all the sugar that is usually consumed during this holiday. >> Grab a set of Chalk Easter Eggs here! If you live in an area that isn’t too hot on Easter Sunday, then hard-boiled eggs would be a great option for you! 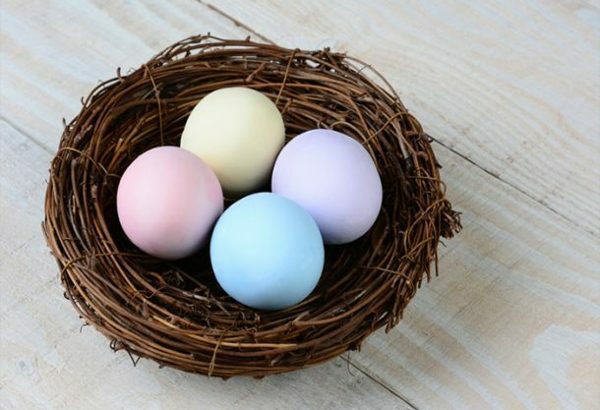 >> Learn how to Dye Eggs Naturally with Food or grab All Natural Food Dye here! 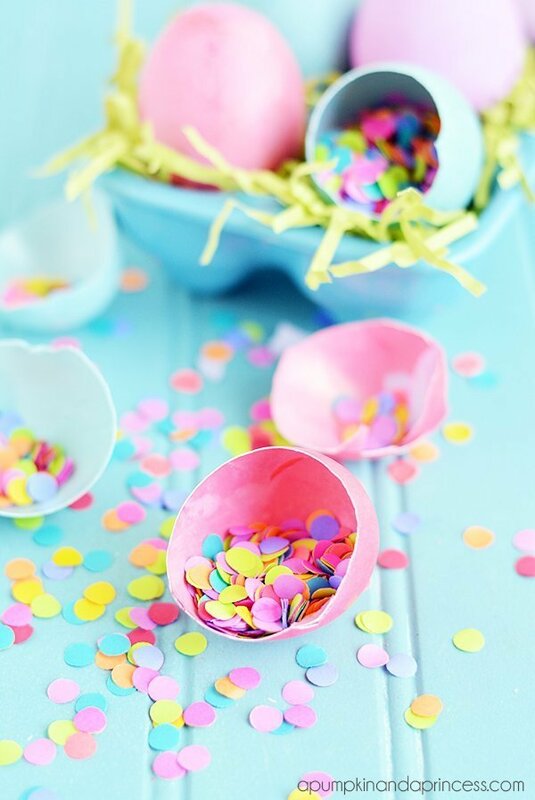 Another fun idea is to make confetti eggs using just the egg shell and bits of left over paper. I use a lot of eggs when making big holiday meals for the family, so with just a little extra effort I could save the shells for this fun craft. And all those bills and credit card offers can be shredded for the confetti! This is a great idea for sustainable eggs as the whole egg (shell and confetti) can be added to your compost heap with you’re done and it will compost down for next season’s garden! Note: If you are going for a strictly organic garden, you may want to skip adding the paper to the garden if it has ink on it. 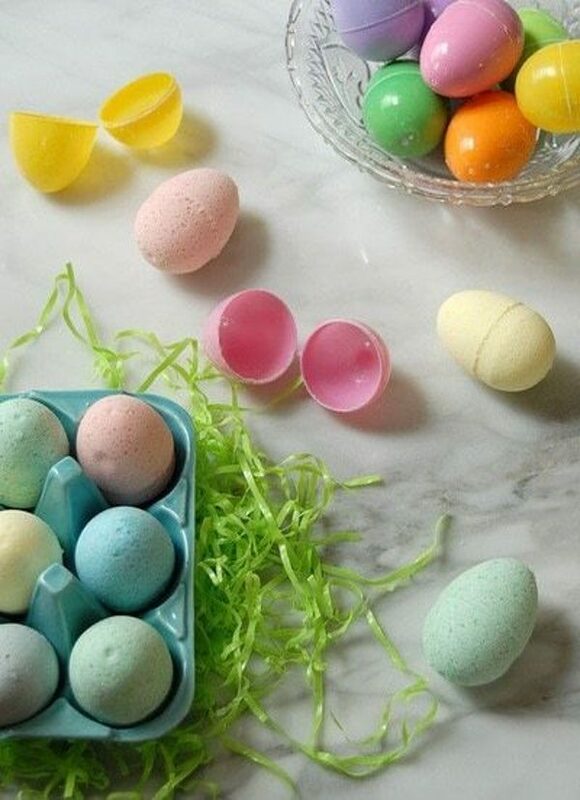 >> Learn how to make Confetti Eggs. This is such a great idea for toddlers who are still taking sit down baths, though older kids may like the special bath time too! 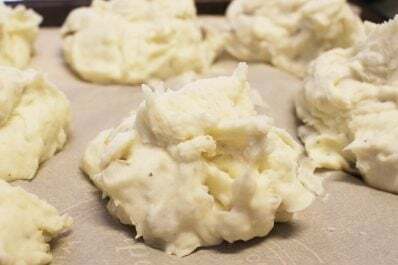 With just a few common ingredients you can make these sweet bath bombs that can be enjoyed and gone in a week or so. I’d use natural food dye instead of the artificial dye listed, you can get all natural food dye here. >> Make your own Easter Egg Bath Bombs! Using birdseed, gelatin, and a little water, you can have these adorable bird feeders! You could still hide them for the kids, then help them hang them up in the trees around your home for the birds! It keeps them out of your house and creates a fun bird watching opportunity for the little ones. Looking for Fun Homemade Easter Gift Ideas? It’s not just the eggs of course, most baskets include a little gift or two. Here are some great ideas to get you started! And here are some homemade candy options too! Thanks for the great non plastic ideas! My grand daughter doesn’t like sweets either so the non candy ideas are great too! Fabulous, Susan! I’m so glad to be able to offer a few ideas! Happy Easter to you and your family!